"Yalu" redirects here. For other uses, see Yalu (disambiguation). "Amrokkang" redirects here. For other uses, see Amrokkang Sports Club. The Yalu River, also called the Amrok River or Amnok River, is a river on the border between North Korea and China. 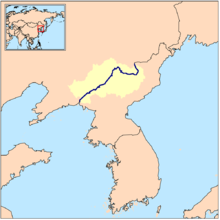 Together with the Tumen River to its east, and a small portion of Paektu Mountain, the Yalu forms the border between North Korea and China and is notable as a site involved in military conflicts such as the First Sino-Japanese War, the Russo-Japanese War, World War II, and the Korean War. Manchu, "the boundary between two countries"
ᡠᠯᠠ) in the Manchu language. The Manchu word yalu (ᠶᠠᠯᡠ) means "the boundary between two countries". In Mandarin Chinese, yālù phonetically approximates the original Manchu word, but literally means "duck green", which was said to have been once the color of the river. The other theory is that the river was named after the combination of its two upper branches, which were called "鴨" (Yā or Ap) and "綠" (Lù or R(or n)ok)", respectively. Revised Romanization of Korean spelled it Amnokgang (Korean pronunciation: [amnok.k͈aŋ]; "Amnok River") and Revised Romanization of Hangeul spelled it Aprokgang (Korean pronunciation: [amnok.k͈aŋ]; "Aprok River"). From 2500 m above sea level on Paektu Mountain on the China–North Korea border, the river flows south to Hyesan before sweeping 130 km northwest to Linjiang and then returning to a more southerly route for a further 300 km to empty into the Korea Bay between Dandong (China) and Sinuiju (North Korea). The bordering Chinese provinces are Jilin and Liaoning. The river is 795 km (493 mi) long and receives water from over 30,000 km² of land. The Yalu's most significant tributaries are the Changjin (장진강; 長津江), the Hochon (허천강; 虛川江), the Tongro (독로강; 禿魯江) and the Ai (瑷河) rivers from Korea and the Hun from China. The river is not easily navigable for most of its length. Most of the river freezes during winter and can be crossed on foot. The depth of the Yalu River varies from some of the more shallow parts on the eastern side in Hyesan (1 m) to the deeper parts of the river near the Yellow Sea (2.5 m). The estuary is the site of the Amrok River estuary Important Bird Area, identified as such by BirdLife International. About 205 islands are on the Yalu. A 1962 border treaty between North Korea and China split the islands according to which ethnic group was living on each island. North Korea possesses 127 and China 78. Due to the division criteria, some islands such as Hwanggumpyong Island belong to North Korea, but abut the Chinese side of the river. The river basin is the site where the ancient Korean kingdom of Goguryeo (Hangul: 고구려) rose to power. Many former fortresses are located along the river and the former capital of that kingdom was situated at what is now the medium-sized city of Ji'an, Jilin along the Yalu, a site rich in Goguryeo era relics. Wihwa Island on the river is historically famous as the place where in 1388, General Yi Songgye (later Taejo of Joseon) decided to turn back his army southward to Kaesong in the first of a series of revolts that eventually led to the establishment of the House of Yi. The Korean side of the river was heavily industrialized during the period of Japanese rule (1910–1945), and by 1945 almost 20% of Imperial Japan's total industrial output originated in Korea. During the Korean War, the movement of United Nations troops approaching the river precipitated massive Chinese intervention from around Dandong. In the course of the conflict every bridge across the river except one was destroyed. The one remaining bridge was the Sino–Korean Friendship Bridge connecting Sinuiju, North Korea to Dandong, China. During the war the valley surrounding the western end of the river also became the focal point of a series of dogfights for air superiority over North Korea, earning the nickname "MiG Alley" in reference to the MiG-15 fighters flown by the combined North Korean, Chinese and Soviet forces. It was the advance of UN forces during the Korean War toward the Yalu which allowed Chairman Mao Zedong to convince his people that China needed to intervene over fears of an American invasion, since toppling communism was one of America's stated goals and Douglas MacArthur had expressed his desire to expand the war into China. The river has frequently been crossed by North Koreans fleeing to China since the early 1990s, although the Tumen River is the most used way. The river is important for hydroelectric power, and one of the largest hydroelectric dams in Asia is in Sup'ung Dam, 106 m high and over 850 m long, located upstream from Sinuiju, North Korea. The dam has created an artificial lake over a portion of the river, called Supung Lake. In addition the river is used for transportation, particularly of lumber from its forested banks. The river provides fish for the local population. Downstream of Sup'ung is the Taipingwan Dam. Upstream of Sup'ung is the Unbong Dam. Both dams produce hydroelectric power, as well. 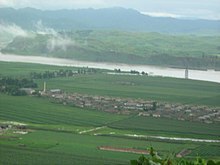 In the river delta upstream from Dandong and adjacent to Hushan are several North Korean villages. Economic conditions in these villages have been described as poor, without access to electricity. ^ "A trip to the North Korea-China border, in photos". NK News. 29 May 2015. ^ "Amrok River estuary". Important Bird Areas factsheet. BirdLife International. 2013. Retrieved 2013-04-25. ^ Jeong Woo-sang (10 June 2011). "What Is Hwanggumpyong Island?". Digital Chosun. Retrieved 1 March 2012. ^ "We took a boatride on the Yalu River across the Sino-Korean Border. Here's what we saw". visitthedprk.org. 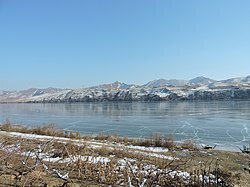 Wikimedia Commons has media related to Yalu River. "Ya-lu-kiang" . New International Encyclopedia. 1905.